Yesterday I did a very stupid thing. Ran git init, git add . and git reset --hard in succession, in a new Node.js project directory. Every modification that I had done before initializing the git repository was gone. Fortuntately, I was able to restore the files from a Node.js process that had been still running my app. Here’s how I did it. Node.js is known to provide a debugging interface. 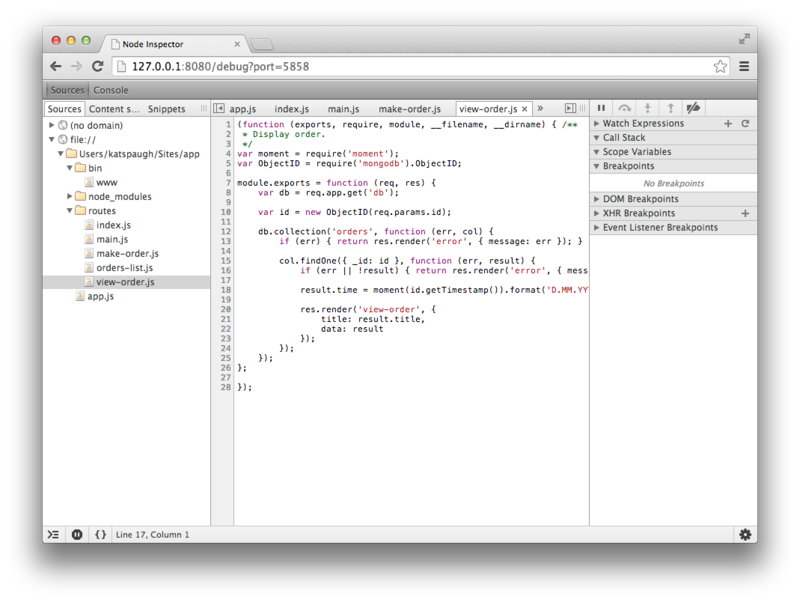 One cool thing people did with this interface is build a Chrome DevTools front-end for it. It’s called Node Inspector. You can view the in-memory resources, set breakpoints, execute expressions step-by-step and inspect variable values. The id is in the second column. That’s it! Now you can just copy & paste all your application files, loaded into the Node.js process, from the DevTools resources panel.